Third Sunday of Lent. Luke 13,1-9. “But I tell you, if you do not repent, you will all perish as they did!”—Hearing of these terrifying events, our Lord uses this occasion to draw his listeners to repentance. He does this through inciting fear in their hearts, lest a similar calamity should befall them; or what is worse, lest, dying in sin, they should be punished with the fires of hell. So, Cornelius a’ Lapide interprets the passage: “Christ made a wise use of this occasion, and drew from it an argument to rouse them to repentance, lest a similar vengeance should fall upon them.” He then adds, “God, then, orders these events for the chastisement and correction of man, that others, seeing their neighbors killed by the fall of a tower or some other sudden accident, may fear lest something similar happen to themselves, and so may repent and reconcile themselves to God, lest they be overwhelmed by His judgments and condemned to Gehenna” (Commentary on Luke). Second Sunday of Lent. Luke 9:28b-36. "Jesus took Peter, John, and James and went up the mountain to pray. While he was praying his face changed in appearance and his clothing became dazzling white. And behold, two men were conversing with him, Moses and Elijah, who appeared in glory and spoke of his exodus that he was going to accomplish in Jerusalem. Peter and his companions had been overcome by sleep, but becoming fully awake, they saw his glory and the two men standing with him. 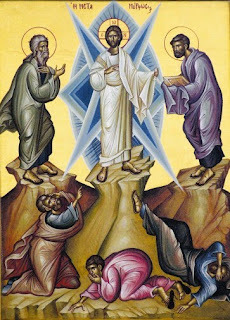 As they were about to part from him, Peter said to Jesus, “Master, it is good that we are here; let us make three tents, one for you, one for Moses, and one for Elijah.” But he did not know what he was saying. While he was still speaking, a cloud came and cast a shadow over them, and they became frightened when they entered the cloud. Then from the cloud came a voice that said, “This is my chosen Son; listen to him.” After the voice had spoken, Jesus was found alone. They fell silent and did not at that time tell anyone what they had seen." “His face changed in appearance and his clothing became dazzling white.”—This proves the reality of the transfiguration of Christ our Lord. Objections: 1. It would seem that the transfiguration of Christ’s body was only imaginary and not real. 2. It would seem that this clarity is not the clarity of glory, since Christ’s body was not then made immortal, nor was this clarity permanent. First Sunday of Lent. 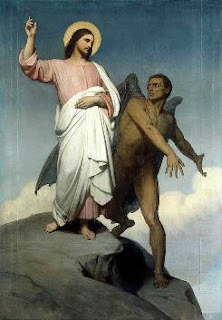 Luke 4: 1-13 Filled with the Holy Spirit, Jesus returned from the Jordan and was led by the Spirit into the desert for forty days, to be tempted by the devil. He ate nothing during those days, and when they were over he was hungry. The devil said to him, “If you are the Son of God, command this stone to become bread.” Jesus answered him, “It is written, One does not live on bread alone.” Then he took him up and showed him all the kingdoms of the world in a single instant. The devil said to him, “I shall give to you all this power and glory; for it has been handed over to me, and I may give it to whomever I wish. All this will be yours, if you worship me.” Jesus said to him in reply, “It is written: You shall worship the Lord, your God, and him alone shall you serve.” Then he led him to Jerusalem, made him stand on the parapet of the temple, and said to him, “If you are the Son of God, throw yourself down from here, for it is written: He will command his angels concerning you, to guard you, and: With their hands they will support you,lest you dash your foot against a stone.” Jesus said to him in reply, “It also says, You shall not put the Lord, your God, to the test.” When the devil had finished every temptation, he departed from him for a time. 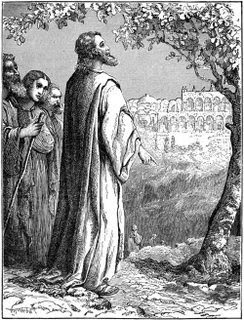 In his Commentary on Job 1:6, St. Thomas defines the literal sense as that which is intended by the words, whether properly or figuratively (e.g. by a metaphor). In his Commentary on Galatians, St. Thomas gives a fuller explanation of his theory regarding the literal and spiritual senses of Scripture—this same theory is proposed also in the Summa Theologiae I, q.1, a. 10 and the Quaestiones de quolibet VII, q.6, a.1-3. He states that signification is twofold, either occurring from the use of a word to signify a thing or from the use of a thing (itself signified by a word) to signify another thing. The first of these significations pertains to the literal or historical sense, while the second pertains to the mystical or spiritual sense. 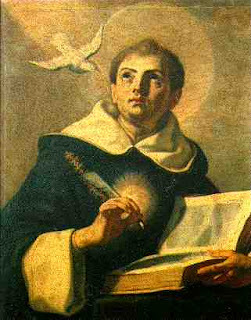 St. Thomas does not think, however, that man is capable (unaided by the particular grace of inspiration) of signifying things according to the mystical sense. Rather, to signify a thing by the use of another thing (itself signified by words) is peculiar to Sacred Scripture and is accomplished not according to the powers of the human author, but according to the power of God, who is the principle author. According to St. Thomas, God is the author of the spiritual sense and the literal sense. In point of fact, St. Thomas suggests that the literal sense may signify more even than the human author comprehends, since even the literal sense relies primarily on that signification which God intends (ST I, q.1, a.10). Needless to say, the spiritual sense, it seems, always pertains exclusively to the divine intention and must always go beyond the comprehension of the human author whose powers are unable to signifying things with other things. It is with great joy that the New Theological Movement announces the following series by an outstanding priest who is currently studying dogmatic theology in Rome and who has a love and knowledge for Scriptural studies; which no doubt lie at the heart of dogma. All too often the title of “Scripture Scholar” is reserved to a small class of individuals who have lived only during the past few hundred years and who, while excelling in the knowledge of ancient languages and cultures, all too often have little to say regarding doctrine and the content of the Christian Faith. Thus, in modern times, the “Scripture Scholar” is not the “Theologian,” but is rather a linguist and historian. On the other hand, there are some signs of a renewed interest in the commentarial tradition of the Fathers of the Church (for example, the “Ancient Christian Commentaries” series). Connected with this trend is the revival of the “mystical interpretation” of Scripture and a growing curiosity toward the allegorical sense. Certainly, many advancements have come from each of these movements and we must not be too quick to dismiss the achievements of these two (often competing) trends. However, it is striking to notice that almost no attention is given to the tradition of Christian scriptural commentary which developed between about AD 800 and 1800. It seems high time that this 1000 year lacuna be filled in! It will be the goal of the “Thomistic Scripture Commentary Series” to contribute in some small way by filling in this enormous gap. With this series, it is my intention to comment on two to three theological points from the readings of the upcoming Sunday liturgy (OF). This will not be a textual or historical commentary, but a theological commentary on the sacred text. There will be several obvious difficulties with this approach, since I will comment on theological doctrines as they happen to come up in the Sunday lectionary, which is not likely to correspond to the inherent inter-relation of those doctrines. This will no doubt be somewhat of an obstacle, as the inter-dependence of doctrine resists the tendency to isolate one teaching from the others. I hope to address this difficulty by providing, each week, a brief bibliography for the various doctrines connected to the main topics. Hopefully, this will be useful to any who are interested in further study. 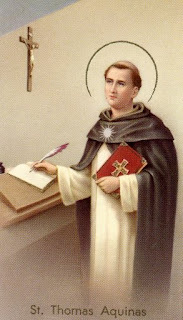 As the title of the series suggests, I will rely primarily on the writings of St. Thomas Aquinas - although I will occasionally make use of others, such as Cornelius a Lapide, etc... The commentaries will begin Sunday February 14, 2010 in preparation for the first Sunday of Lent.